Today — September 29 — is the 150th anniversary of the Civil War battle of Chaffin’s Farm. The battle is significant because Milton Holland, a mixed race native of Texas was awarded the Medal of Honor for his actions during the battle. He was one of sixteen black soldiers awarded the Medal of Honor during the Civil War. Holland’s mother, brother, and white father are all buried in Oakwood Cemetery in Austin. 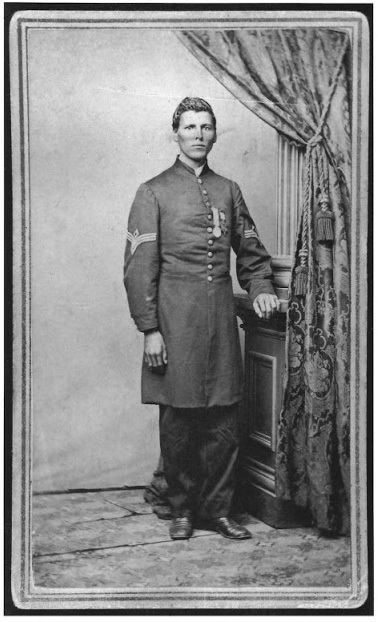 His father was killed while serving in the Confederate Army in April 1864. Milton’s brother, William, served in the Union Army and was later elected to the Texas Legislature. William helped found the Deaf, Dumb, and Blind Institute for Colored Youth (which merged with Texas School for the Deaf in 1965 and integrated in 1966) as well as Prairie View A&M University. Milton Holland is buried in Arlington National Cemetery. For more on this fascinating story, read this amply illustrated blog by Elyce Feliz.